Juicy Detailing was born in 2009 from a passion of keeping our own cars in tip top condition. Over the years a simple car wash has become a bit of an obsession, including washing, decontamination and polishing including spending a small fortune on a nice collection of waxes, just to have the shiniest cars on the block. 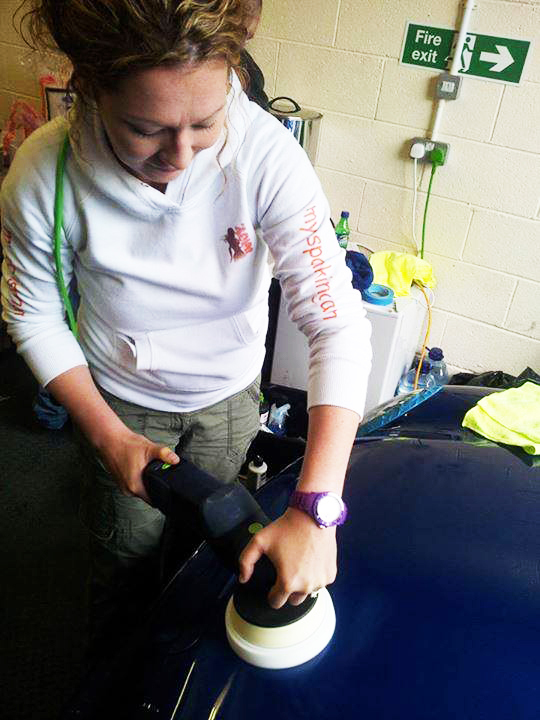 Jen our founder is one of an elite group of female detailers, who can certainly show the guys a thing or two. She doesn’t detail full time (even though she would love too), as she has 4 great children to look after and also joint MD of our parent company Diesel Tuning UK LTD.
One day at work she mentioned to Andrew (her partner and MD at DTUK) that she fancied doing something else. As detailing is such a passion of hers, it was suggested that she should look into offering DTUK customers the option to purchase some of the best car care and detailing items currently available. This is where Juicy Detailing.co.uk was created. After deciding to purchase a large quantity of Dodo Juice products, things started to roll, and we offered these items to our customers who have been over the moon. A few asked us if we could supply products from various manufacturers including Chemical Guys, Collinite, 303, 3M to name a few. So the decision was made to invest some more into bringing more items into our portfolio. We have gone from strength to strength since setting up, not only extending the brand range which we continue to do; regular open days throughout the year at our premises and attending various car shows around the country. These can be seen through our Events Section. Jen or one of the team is always on hand to answer any questions that you may have in regard to products and advice on methods of how to use. You have access either via the Ask Me Anything Section; in store or simply pick up the phone and we’ll be delighted to speak with you. Juicy Detailing.co.uk is part of Diesel Tuning UK Limited also known as DTUK. Since 2006 the business has grown into one of World’s best and well known suppliers of tuning performance modules for both Diesel and Petrol, www.diesel-performance.co.uk selling in excess of 2000 systems per year. We’ve taken the same business ethics and ethos and injected them into Juicy Detailing.co.uk. We aim to offer the best value for money, with the service, pre and after sales to match. Trust us to supply you with some of the best products at a reasonable cost in today’s market place, we won’t let you down. Our new website launched in March 2014 has evolved from experiences over the years based on our previous site and how business has progressed to enable us to offer a better learning and buying procedure. We have gone more in depth with the guides, videos and have hints and tips on each individual product where appropriate. It will continue to improve with new information to help you achieve your goals and as always be are open to your suggestions and comments.